Jaden, a fifteen year old girl, moves to Louisiana to help her mother fix up a rundown mansion inherited by their family. The teenager, who is constantly picked-on by her older sister, runs off one day after a tiff and finds herself in the midst of real-life horror. When she accidentally discovers the Mal Rous, genetic mutant carnivorous creatures, she becomes altered. 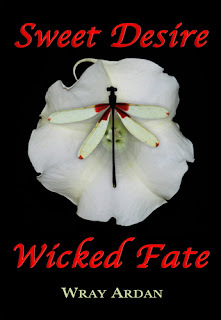 Author Wray Arden’s Sweet Desire Wicked Fate is a hair-raising dark fantasy thriller interspersed with fantastic moments of humor which will hold great appeal for teenage girls. With well developed characters, and a unique plot, this book is hard to put down. Definitely not for the weak-stomached nor gentle souls, horror and fantasy lovers will devour and enjoy.